All the secrets for THE BEST Chocolate Chip Cookies. My brother in law makes the best chocolate chip cookies…sorry to my Mom and sister…but it’s true, his chocolate chip cookies are the best. He shared all his secrets with me and said I could share them here…so take notes, this is a good one! #1 The Recipe. He sticks with America’s Favorite Recipe…because it’s the best and he’s American. We make just a few changes to this classic recipe…see our printed recipe below. #2 The Key Ingredient. He uses Butter Flavored Crisco instead of butter. This is the key my friends. #3 The Shape. He molds them uniformly. We love using the small ice cream scoop for this step to get the job done fast. #5 The Helper. She needs to be smart, sassy and love to eat lots of cookie dough. This step is optional, but it sure makes it more fun. #6 The Method: Undercook & Cover. About 10-11 minutes in the oven, then cover them with your not-so-favorite-okay-to-get-greasy designated cookie covering hand towels. Make sure your hand towels are free from detergents so they won’t make your cookies smell or taste like laundry detergent. Then walk away. Leave them there on the cookie sheet with parchment and let them cool. #7 Enjoy! 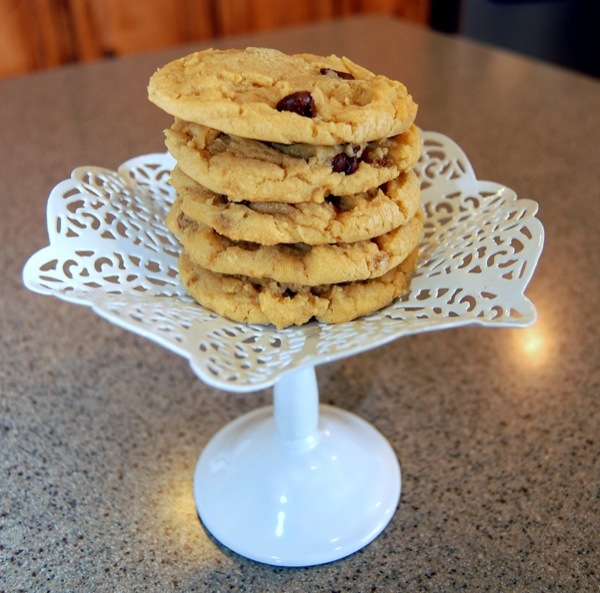 …the perfection in the Best Chocolate Chip Cookies! Mmmmm. 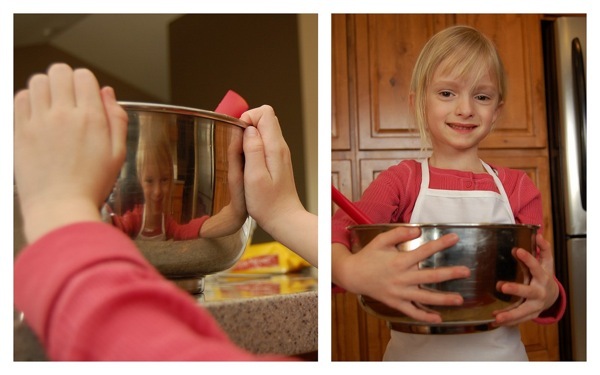 Combine dry ingredients: flour, baking soda and salt in a medium bowl. In a stand mixer whip the butter flavored crisco until lightened in color. Add in the sugar, brown sugar and vanilla and mix together until creamy. Gradually add in the dry ingredients and mix until incorporated. 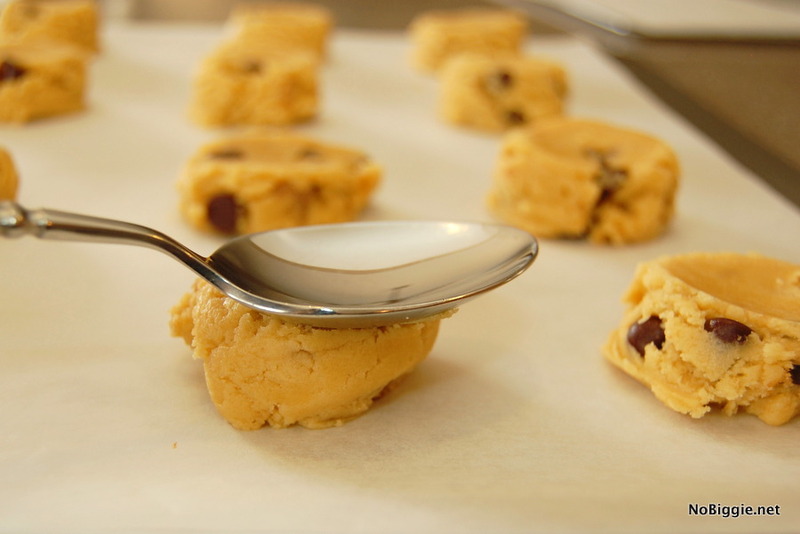 With a round ice cream scoop, drop cookie dough balls onto a parchment lined sheet pan. 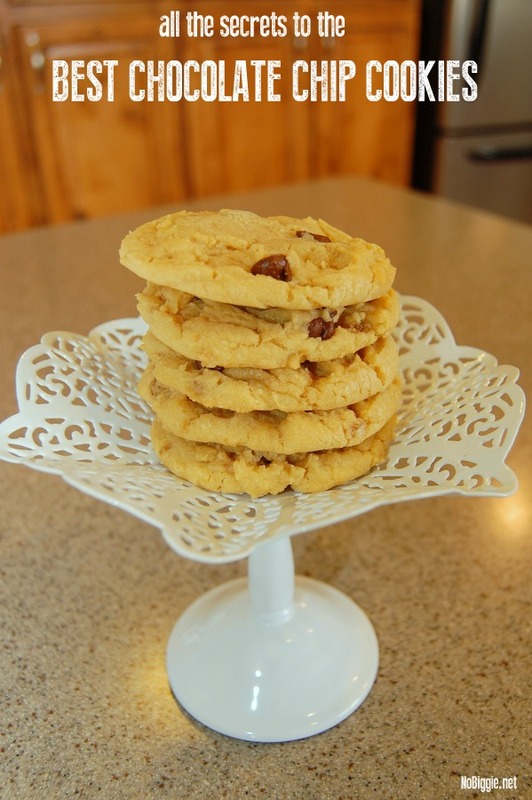 Place desired chocolate chips on the tops of each cookie (we prefer less chocolate chips, but you can add more if desired). 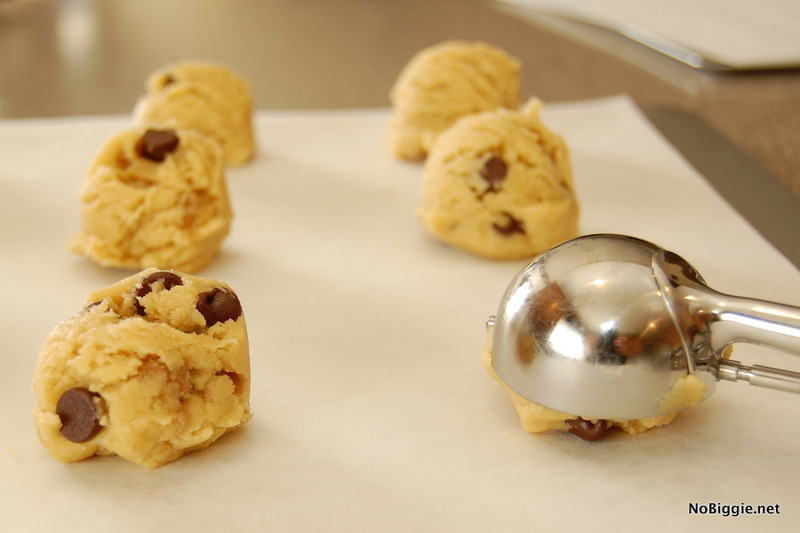 With the back of a spoon, press each cookie dough ball down to help flatten is out a bit before baking. Bake for 10-11 minutes until slightly golden brown. 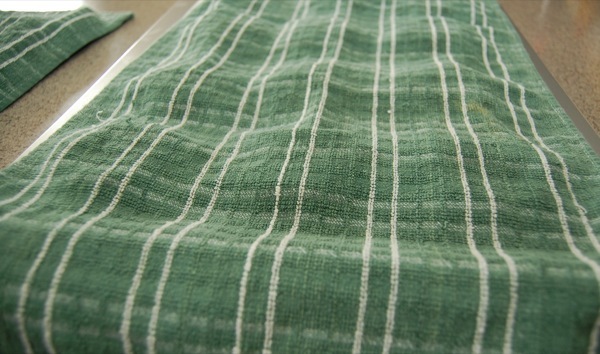 Cool on baking sheets covered with a hand towel for 10-15 minutes. oh, how i do love it when you share secrets with me! You wrote this for me, even if you didn’t know it. I’ve been in a years-long battle with the chocolate chip cookie. Now I have a new game plan. Thanks! I have heard that but I have never tried it, now I will. Especially because it’s low in fat, right?!? I think I might need to taste them. Ok Matt and Becky and Kami, I am throwing down the gauntlet. Let’s have a cookie bakeoff contest. I will win, won’t I Becky?? I have to admit those look perfect. And I love the model. Okay, now I am going to have to try. I love cookies! Thanks for the tips. um, yes please. YUM! thank you to matt for letting you share this! mmmm, I love chocolate chop cookies!! Thanks for the inside scoop!! I will take a plate of those to go please!!! Thanks for the tips Kami! I can use all of the help I can get around here. I have heard about covering the cookies with a towel before but not tried it yet. 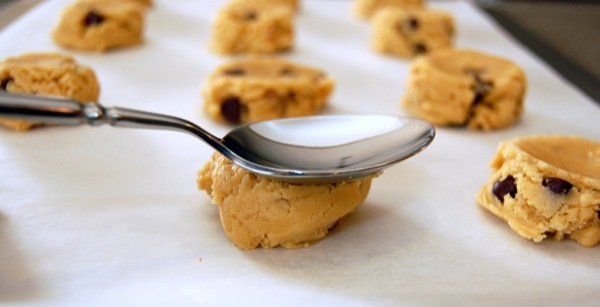 I was a chocolate chip cookie idiot and then about 10 years ago a nice little girl named MINDI shared the recipe of all recipes… 4 sticks of butter, vanilla pudding, 61/2 cups of flour… it will kill average mixers, but the bosch and I can whip this together in no time! I knew we were friends when I saw the just say no to the chopped nuts! I still can’t believe Matt let you share all his secrets. They really are the best. Kyle’s brownies should be next! Yeah! That is such a great blog. I can’t wait for Matt to see it. He finally gets the credit he has deserved for so long. Thanks Kami! wow, thanks for sharing of Matt’s methods. there’s nobody who loves a good cookie recipe with lots of secrets more than me. Whoa! Those are some seriously fabulous tips! And AMAZING looking cookies. I’m putting butter flavored crisco on my shopping list!! And I’m happy to have found another “no nuts” girl!! Yummy!!! I can’t wait to try this secret out, thanks for sharing!!!! You are the BEST! You just can’t beat the Toll House. I’ve tried a few other recipe’s (and actually heard my Grandmother rolling over in her grave) and there is nothing that holds a candle to the Toll House. 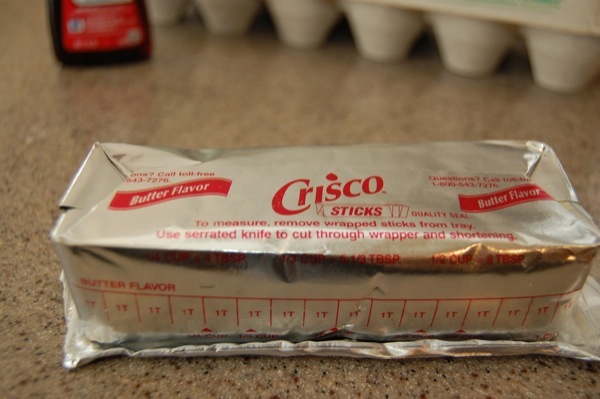 I use some of the same tricks too, except I never use all Crisco. 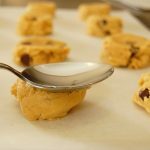 Have you read the NYT article on chocolate chip cookies? It’s bee on my blog to-do for ages. Did you just use the one stick of Crisco or two? I can’t wait to try this! I’ve always poked fun at Ben when he talks about his mom’s cookies. Growing up she would always have freshly baked cookies on hand and Ben would eat two or three every day after school. 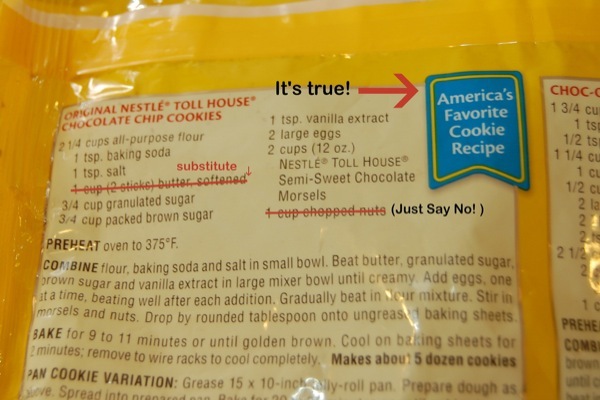 But they weren’t just any cookies…they were the tollhouse recipe! And Nancy would make them with a wooden spoon. He always says they were “flat”. So I’ll try this and see if they stack up to his memories. Ugh… one more thing to miss about Utah! I don’t care you ‘ya are- you don’t make them as good as Matt! Rachael Ray eat your heart out! It’s late, I’m hungry, and I’m going to have to make those soon! Also I love your photo wall, great idea. I love Tara Whitney! i went and got my needed ingredients and i’ll be making them today ! Yay! im making these today! and im soooo excited. ill tell ya’ll how it goes. Those look good, but I like my cookies thicker. I think I’ll try this and skip the smash step. I made these yesterday (had to search a couple stores to find the Butter Crisco), and they were delicious! Sad to say, they are all gone today. Thanks for sharing! I have been using this recipe for YEARS!!! I have always substituted the butter for crisco!! I feel like a rock star right now because I have already been making the BEST cookies!!! So how long do you bake them if you are “underbaking”? Thanks. So want to try. I usually do 10 – 12 minutes.